* implant of the chin, one night at the clinic, transfer airport-hotel and accompaniment included. The chin is often forgotten element, which nevertheless, like the nose, plays a preponderant role in the balance of a face. 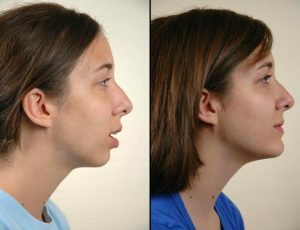 It is a solution if there is an underdeveloped or chin and jaw. Especially when you have a relatively short chin or your chin is practically in the neck, enlargement with an implant results in aesthetic and subtle result. An implant is a solid silicone prosthesis, implants are available in various shapes and sizes. You can also perform a chin correction in combination with other aesthetic operations, for example, a facelift or a new nose. Through an incision, the implant is inserted. The implant of the chin is placed under the muscles of the chin and beneath the membrane of the maxilla, after the incision is sutured. We use a special technique, developed to give minimal scars. This gives a very small scar that will not be visible. The implant can also be inserted through the inside of the mouth. An incision is made near the bit between the teeth and the underside of the lip. This method does not leave any scars. This operation takes place under general anesthesia, lasts 1h30 and requires a stay of 3-4 days on the spot.